When Harvey Norman wanted a partner to bring sustainable energy to more of their customers, they went with the company with over 20 years combined solar experience across homes, businesses and farms. Together we want to help Kiwi homes and businesses reduce their power bills with sustainable and innovative energy solutions. With a team of solar experts, we have installed solar systems on residential, commercial and farm sites across New Zealand. We know solar. We’ve researched the market to find the best solar products for NZ’s weather conditions. We have a close, personal relationships with our chosen partners and are accredited to sell their products in NZ. 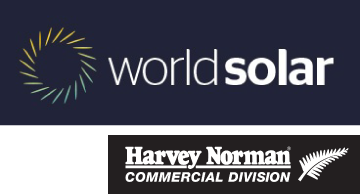 Rest assured we’re working with industry leaders you can trust, like Trina Solar - the world’s leading panel manufacturer, Solar Edge, SolaX and Enphase. Whoever you deal with in our team of solar consultants, you’ll get friendly, knowledgeable and professional advice. We’ll provide you with what you need to know every step of the way. From your initial quote right through installation and monitoring, we believe solar should be an easy and satisfying experience for Kiwis. The team at World Solar are keen to pass on their knowledge after years working within the renewable energy industry across Australia and New Zealand. Together they have over 20 years solar PV installation experience on residential, commercial and agricultural sites. Since launching World Solar in New Zealand in 2013 the team drawn on all their knowledge and motivation to save more Kiwis money. They continue to get a kick out of seeing the reactions from customers to their solar systems as well as doing their bit to keep New Zealand green. The extra daylight hours in this part of the world provide a natural advantage. The power outputs are on a par with the sunniest places in the world, which is due to the cooler days but stronger sunlight in New Zealand. The result is perfect Solar PV conditions. It’s always great to see the look on people’s faces when we show them the savings they can get with solar. We’ll turn up on time, provide an accurate quote and answer all your questions in plain English. That’s a promise. We want to reduce the reliance of New Zealand homes and businesses on energy sourced from fossil fuels.